Do you know how much you weigh? If you’re like most weight conscious addicts, chances are you step on the scale every day. Society feeds into this obsession by measuring “progress” through scale weight: whether it’s your doctor weighing you each visit or weight loss groups gauging your success or failure. Even social media focuses on it being a major health factor. It is difficult to avoid all of this misinformation. Scale weight is a poor indicator of progress since it only gives you a general number and does not reflect your body composition–the combination of lean body mass and fat weight. 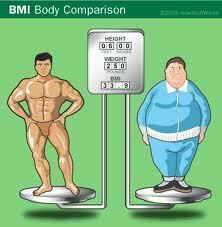 Lean body mass has a much greater density than fat weight; muscle weighs more by volume. An analogy of this is a boulder and a beach ball with the same dimension. The boulder is more solid; hence, as a person becomes more fit, his/her fat is displaced while dense muscle is gained. The following picture shows how two men can be the same height and weight, yet one wears a size thirty-two while the other wears a size forty. If there ever was any doubt why females should not step on the scale to measure their progress, consider their monthly hormonal fluctuations. It is not unusual for women to gain five or more pounds of water during their premenstrual period, due to fluid retention. Even though it is only temporary, it does add up to extra weight on the scale. There is not an accurate scale in existence that factors in water retention; therefore, failure is eminent. The best way to accurately measure body composition is through body fat testing. There are several modalities that accomplish this; though, they differ in accuracy, ease of measurement, and expense. Underwater weighing, bioelectrical impedance, bod pod (air displacement), and skinfold measurements are various methods used. Skinfold measurement is the most widely accepted testing method (outside of clinical testing) because of the consistency and high success rate of the results. According to the American College of Sports Medicine, when performed by a trained and skilled tester, there is an accuracy of ninety eight percent. Skinfold measurement uses calipers to pinch subcutaneous tissue on three to nine anatomical sites throughout the body. The thickness of each pinch is plugged into a formula to determine a person’s body fat percentage. Knowing your body fat percentage is more important than stepping on a scale or using any chart such as the BMI (Body Mass Index). (Click here to read last week’s post on the BMI.) It plays an important role in a person’s health, since excess body fat can lead to obesity and other related diseases. Have you ever wanted to know your body composition? Do you want to increase your lean body mass while decreasing fat weight? Contact Dan at (978) 807-8579 or visit seachangefitness.net.